All is in readiness for next Monday?s unveiling ofSpaceShipTwo ? 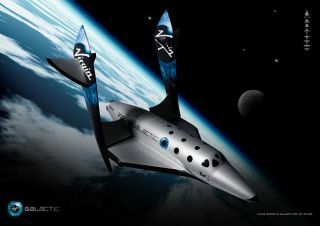 the first-class space tourist?s wonder machine at the core ofthe space tourism firm Virgin Galactic?s suborbital fleet. The scene is spacecraft manufacturer Scaled Composites atthe Mojave Air and Space Port in California. No doubt, there?s plenty of pompand circumstance that?s due this debut ? although specific aspects about therocket plane?s rollout remain under wraps. SpaceShipTwo is a carboncomposite cousin in construction and design to SpaceShipOne ? the privatelyfinanced, single-piloted spacecraft that bagged the $10 million Ansari X Prizepurse by flying back-to-back treks to suborbital space in 2004. That ?Tier One? project was under the wing of veteran aerospacedesigner Burt Rutan, along with his team at Scaled Composites, and funded bygreenbacks from Microsoft co-founder Paul Allen.Over $100 million in cold cash was doled out in hot pursuit of the prize. SpaceShipTwo is a six-passenger, two-pilot affair. But thistime, the endeavor is backed by British billionaire and knighted adventurer SirRichard Branson. Never short on entrepreneurial chutzpa, Branson createdVirgin Galactic, a firm keen on cornering the public-travel-to-outer-spacemarket ? first to suborbital heights and then, given a follow-on spaceshipdesign, onward to orbital jaunts. The suborbital SpaceShipTwo is powered by a hybrid rocketmotor, with strap-in accommodations going for $200,000 a seat. Some 250 VirginGalactic astronauts-in-training have already reserved tickets, according to thegroup?s website. The airliner-sized WhiteKnight Two ? painted in the livery of Virgin Galactic and dubbed VMS Eve ? hasalso been built under contract by Scaled Composites for Virgin Galactic andwill serve as the high-altitude mothership - not only for deploying the passenger-carryingSpaceShipTwo but also for lobbing satellites into low Earth orbit. Branson?s Virgin Galactic is establishing its headquartersto operate private space flights from Spaceport America, billed as the world?sfirst ?purpose built? commercial spaceport which is now under construction outsideLas Cruces, New Mexico. ?Everyone at Scaled is looking forward to the VirginGalactic ?unveil event? on December 7,? said Rutan, who founded ScaledComposites and now serves as the firm?s chief technology officer and chairman emeritus. Rutan is quick to offer a tip of his draftsman hat to thedevelopers of Scaled Composites Commercial Suborbital Space System: DesignersJim Tighe, Bob Morgan, Matt Stinemetze, and Marc Zeitlin, along with theirdesign and assembly teams ?that have worked long and hard for this milestone,?he told SPACE.com. ?They look forward to seeing SpaceShipTwo joinWhiteKnightTwo in the air over MojaveSpaceport as it conducts the critical flight tests under the direction ofFlight Test Operations Chief Pete Siebold,? Rutan explained. ?Scaled is proud indeed to be growing during the recession and to be makinghistory again by developing the world?s first manned spaceflight systemsintended to fly the public,? Rutan added. Also hungry to see SpaceShipTwo?s rollout and a successfulshakedown of the WhiteKnightTwo/SpaceShipTwo combo is Steve Landeene, ExecutiveDirector of New Mexico?s Spaceport America ? the home launch site for VirginGalactic?s commercial operations. ?The rollout symbolizes the reality of commercial space andthe next era of space exploration, experimentation, and transportation,? said SteveLandeene, executive director of Spaceport America. From Landeene?s front-row view, Virgin Galactic?s flighttest program and SpaceportAmerica?s construction are running in parallel. In his estimation, thatmatching up of events ?will culminate in what promises to change the world andhow we access and utilize space forever.? As captured in a 2005 Memorandum of Agreement, Landeenesaid, the vision of Richard Branson and New Mexico Governor Bill Richardson isnow becoming real. New paradigm in space access? ?Spaceport America is rapidly becoming reality in concertwith Virgin Galactic?s flight test program,? Landeene said. As evidence, the10,000-foot-long by 200-foot-wide concrete runway is to be finished by thesummer of 2010 and ready for action. By the way, that runway apron is capableof taking on the landing of nearly any aircraft in the world. Also, the contract to build Spaceport America?sTerminal/Hangar Facility that will house the operational offices of VirginGalactic?s world headquarters has recently been awarded. That structure is projectedto be complete by early 2011. ?This is bigger than space tourism,? added Landeene. ?It isabout the industrialization of space through development of unique andinnovative ways to access space.? Landeene?s bottom line for next week?s Virgin Galactic SpaceShipTworollout: ?It represents a huge milestone in the reality of a whole new paradigmin space access. ?